Enucleation Evisceration Surgery | Ocular Prosthetics, Inc. Your doctor is your first and foremost resource for information concerning your surgery. The description of these procedures are available as a general guide, but your specific procedure may vary. For a more detailed explanation of these procedures as they pertain to your specific circumstances, please consult with your physician. An enucleation involves the detachment of the eye muscles and optic nerve. 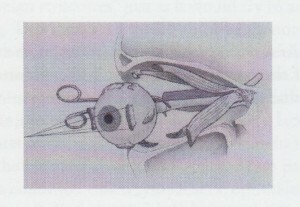 This procedure includes the removal of the eyeball, along with all of its internal contents, from the orbital socket. 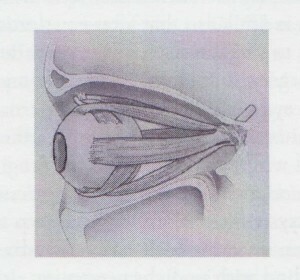 Upon removal of the eye, the muscles are reattached to an ocular implant. The implant will replace the lost volume and deliver movement to the ocular prosthesis. This type of surgery is performed on patients suffering from ocular tumors such as retinoblastoma, severe trauma, and blind painful eyes. For more information on prosthetic eyes following enucleation surgery, please read our blog post, “Prosthetic Eye Treatment for Enucleation Surgery”, found under the Blog Tab. An evisceration involves the surgical opening of the eye. This procedure includes the removal of the internal contents of the eyeball, including the iris, lens, and retina. An orbital implant is placed inside the eye to replace the lost volume and deliver movement to the ocular prosthesis. The eye muscles and optic nerve are left intact. This type of surgery is performed on patients suffering from painful blind eyes usually unresponsive to antibiotics. Removal of the eye can relieve pain and negate the need for further antibiotic treatment. For more information on prosthetic eyes following evisceration surgery, please read our blog post, “Prosthetic Eye Treatment for Evisceration Surgery”, found under the Blog Tab. Following your surgery the eye socket will begin to heal, naturally reducing inflammation and swelling. Depending on your surgeon’s postoperative protocol and your individual healing course, you will typically be referred to an ocularist approximately six weeks after your procedure. This recovery time is an important part of the prosthetic eye fitting process; ensuring that the socket is stable and healthy so that an appropriately sized prosthesis can be designed. There are various fitting and fabrication techniques utilized according to your individual needs. Whichever technique is used by your ocularist, the goal is always the same; to create the highest quality, comfortably fitting, cosmetically matching prosthesis. The entire process will take three to four visits with your ocularist. For more information on the recovery time following surgery, please read our blog post, “Transition Period Between Surgery and Prosthetic Eye Restoration”, found under the Blog Tab.